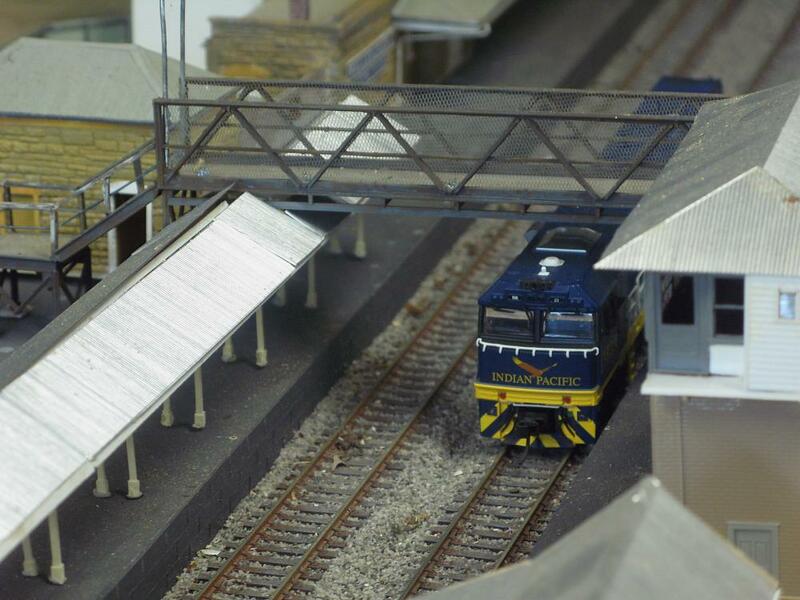 The lighting for the layout has been constructed, wired and painted. Wallerawang will be lit by daylight flourescent tubes screened by a wooden valence. The lighting extends around the scenicked portion of the layout, and will be supported by L-brackets fabricated out of square metal tube. As there is always adequate ambient light at exhibition locations, there is no need to provide lighting for the storage yard. Power to the lights is provided by an extension lead which will plug into a power outlet mounted under one end of the storage yard. To accomodate all the valences in the trailer, a small shelf was built and mounted to store half of the lights. The other half of the valences reside on the trailer floor between the storage yard modules. An upside-down look at one of the lighting valences, this one a small fitting that sits between two longer valences. A length of 12mm plywood is fitted with two 6mm plywood sides - the deeper side forming the front, the shallower side facing the rear, shielding the operators from any direct light. To hold the valences in position, lengths of 25mm square steel tube have been fitted to the top piece on the inside face. Each valence then slides onto solid steel pins located on the ends of the L-brackets. Three of the four diode matrix boards have been completed. These three boards each contain twenty diodes, which will switch the necessary points to the correct direction when a storage track is selected from the pushbuttons on the control panel. Wiring has commenced on the end modules, with the required busses being added first. Feeder wires were soldered onto the bottoms of the rails for each track block and point frog when the track was laid, which makes the process of wiring track power from the control panel on each module much easier. 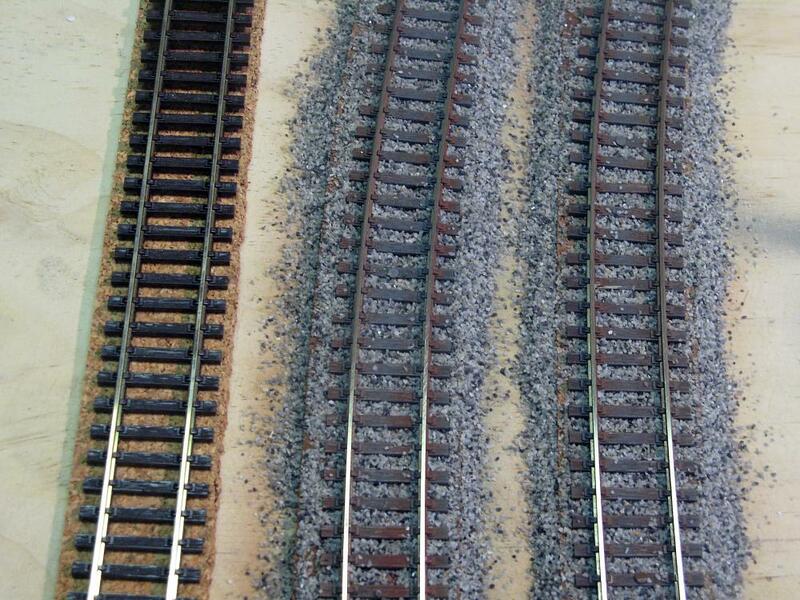 The track on the end modules has also received attention. The sleepers were first given a grey wash to simulate weathered timber before airbrushing the sides of the rails a rusty colour. Ballast was then applied and glued down with a mixture of white glue and water with a drop of detergent added to break the surface tension of the liquid. The two mainlines on an end module, with a new piece of flextrack placed next to them, highlighting the effect a little paint and some ballast can have. During our last meeting we took the opportunity to set up the two front modules to run a locomotive over the track joins. We also temporarily set out the station and other buildings in order to view their overall placement and effect. Indian Pacific livered NR 25 runs light engine through Wallerawang station.